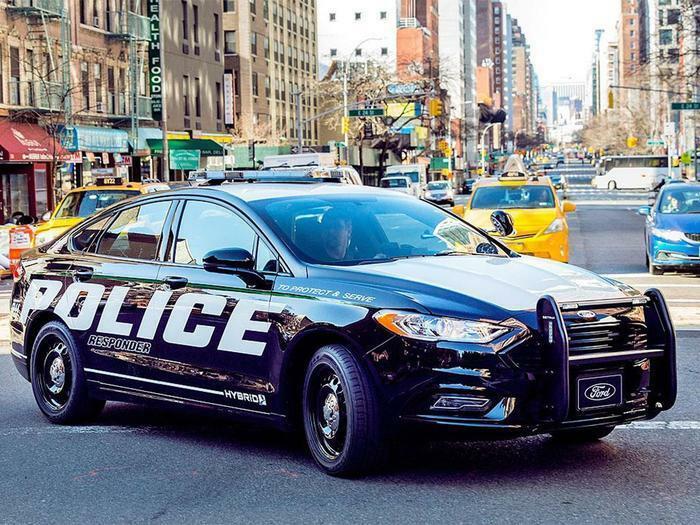 Ford is hoping the car will give it an even bigger share of the police-car market. It currently sells about 63 percent of the police cars in the country and has been making specially equipped police cars since 1920. Besides bigger engines and brakes, the police package generally includes such things as a heavy duty front seat, rear doors that only open from the outside, and vinyl seating that can be hosed down when necessary. The Responder is equipped with a 2.0-liter gas engine paired with an electric motor and battery. Ford says it will save cities about $3,877 a year in fuel costs, based on gasoline priced at $2.50 a gallon. While idling, the car's lithium-ion battery helps power the high electrical loads of a police vehicle, reducing engine run time and saving an estimated 0.27 gallons of fuel per hour. The new vehicle will be the first hybrid sedan with full pursuit capabilities. That means the car is certified by police agencies to be tough enough to handle police pursuits for longer periods at different speeds and over obstacles such as curbs and flooded intersections. The Police Responder Hybrid Sedan uses an efficient Atkinson-cycle 2.0-liter engine with an electric motor fed by an advanced lithium-ion battery. The hybrid is calibrated for law enforcement’s unique duty cycle and will run in battery-only mode up to 60 mph. The car automatically switches to maximum performance – with the engine and battery working at peak acceleration levels – when needed, the company said. The new cruiser was shown yesterday at events in New York and Los Angeles. Both cities have been experimenting with hybrids. “Patrol vehicles are a police officer’s office, and we expect them to not only be economically and environmentally efficient but also an effective tool for fighting crime in major metropolitan areas,” said Los Angeles Police Chief Charlie Beck in a Ford press release.